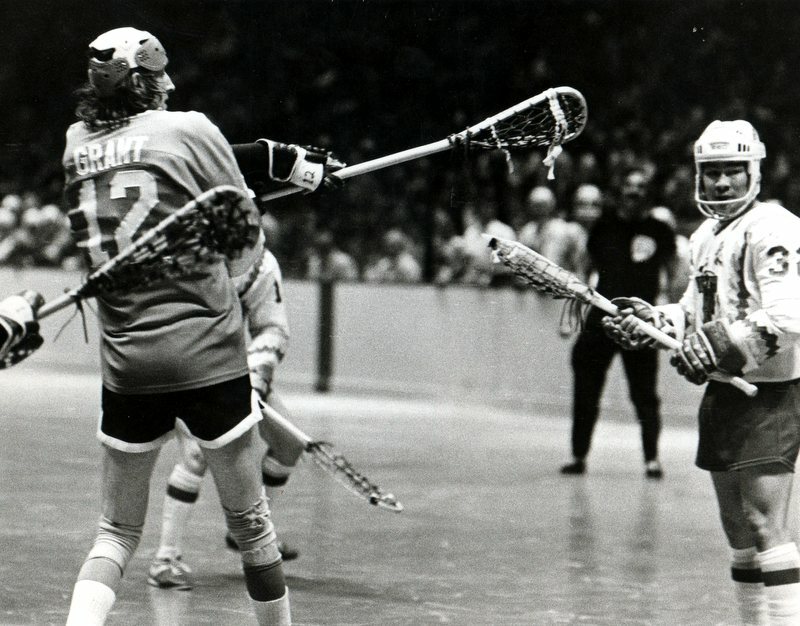 Toronto Tomahawks are supposed to lack some of the superstars of lacrosse that the other teams have in their lineups. However, we believe the Hawks will make up for this with well-balanced consistent, three line running attacks. The absence of stars such as Gaylord Powless, John Davis, Jim Higgs, Kevin Parsons, Paul Suggate and Carm Collins will be countered by Toronto’s pattern plays and constant running. Throughout the Tomahawks’ training camp a special emphasis was placed on the building up of endurance through a strenuous conditioning program that is geared to allow each player to reach his maximum performance level. What we are aiming at is a team that can keep an all out running attack and aggressive defensive play going for the entire 60 minutes. In lacrosse, the faceoff is very important, with the Tomahawks appearing as strong at that position as any of the other five teams. Drawmen like Toronto’s No. 1 draft pick Chuck Li, outstanding veteran Bram Wilfong and Duffy McCarthy, who was the sparkplug of the Windsor Warlocks on their way to the Senior B Canadian championship last year, provide the Tomahawks with experienced depth. The other candidate for the centre position and the surprise of the training camp is Gary Brezany, one of the two U.S. field players on the Toronto roster. Backing up the centre strength are our three goaltenders all of whom shared the goaltending for the Toronto Shooting Stars last year along with Ron Thomas one of the great Indian goaltenders of recent years from the Six Nations Indian Reserve. If the Tomahawks have an edge anywhere it’s down the right-shot side, although we understand most of the clubs believe they also are strong in these positions. Up front is Larry Bell, a converted defenceman, who excels with quick reactions and a consistent running game; Brian Thompson, the Victoria Shamrock scoring ace of last year is having one of the finest games ever, and Tim Havens, who played all- American for Towson State College. In the breakout position or right defence, the Tomahawks appear even stronger led by standouts such as Stan Cox from the Brantford Warriors, aggressive Sandy Lynch who was the New Westminster Salmonbellies’ outstanding player last season, Charlie Marlowe, a 200-pound defenceman who excelled with the Canadian championship Oshawa Green Gaels for several years, and Jack Kastelein another player from last year’s Victoria Shamrocks at 6’ 3,” 205 pounds, certainly one of the west coast’s best defensive players and Terry Williams, whose aggressiveness makes him a candidate for either attack or defence. Although our left shot side doesn’t have as many top candidates for the positions, we do have three solid left shot forwards including Joe McCrae, who was the spiritual leader of the Owen Sound North Stars for several seasons both on and off the floor, and Frank Oda, one of the few Canadian players who also excelled in the American field game and is expecting to have his best season ever. One of the real top players during training camp has been Brian Wilson whose ability to really turn it on with his tremendous speed will allow him to take advantage of the Tomahawks’ fast break style. Behind this trio is Bob Smith from the Toronto Shooting Stars, who is a real contender for one of the starting positions. The left shot break out or defence position is headed up by Jim Hinkson whose all out aggressiveness has played an important role on championship teams at all levels. At least three and possibly four of the six clubs will feature a constant running attack, including the Tomahawks, while it is our opinion that both Philadelphia and Maryland, although utilizing their breakout speed, will probably excel at ball control and set plays. For the Toronto Tomahawks to be serious contenders they will have to maximize their running game which demands top physical conditioning and a complete understanding of their sytem. If this is accomplished then balanced scoring from all positions on the three lines will counteract superior ball handling and the individual brilliance of the top players on some of the other clubs. Assistant coach Bob Hanna along with myself and personnel director Frank Wilbur believe if the above goals are reached then the Tomahawks will have to be rated at least in the top three. With the balance of the recent drafts at this time it is impossible to try to assess the other five clubs although we believe that the league is going to be very evenly matched.